Only 17% of Russians support the appointment of President Vladimir Putin as the “national leader” of Russia. These results, obtained by the independent Levada Center public research group, were reported on December 5th in Vedomosti. According to the Center, 30% think that the idea resembles a cult of personality. 27% are ready to see Putin in the role of national leader, but only if this status is approved by a nationwide vote, or formalized with specific powers by the Constitution. It also turned out that only 39% had heard of the “national leader” movement, and that 60% knew nothing about it. The Levada Center questioned 1600 people in 46 Russian regions between November 23rd and 26th. It should be noted that the Center also found that 84% of respondents approve of Putin. VCIOM , the state polling organization, also conducted a survey, but formulated their questions differently. Their results, which show that higher percentages support the movement, are hard to trust, as the organization is controlled by the government. Critics have disputed their polls as biased toward the Kremlin. Aleksei Grazhdankin of the Levada Center believes that his organization’s results indicate a new democratic culture among Russians. Symptoms of restoration of Soviet traditions irritate the public, according to the sociologist. 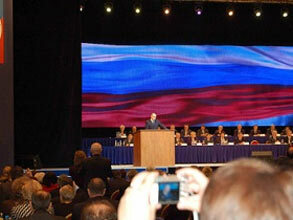 Before the December 2nd State Duma election, Putin had described the vote as a referendum on his rule. He has said that a landslide win by United Russia would give him “moral authority” to retain influence and become Russia’s “national leader.” Meanwhile, a very public movement named “For Putin” has surfaced in the country, and called on Putin to stay in power after his second term ends in 2008. TURNOUT BY DEAD SOULS (A LETTER TO THE PRESIDENT)Moskovskii Komsomolets, December 4, 2007. Dear Mr. President: Do you think the referendum worked? If you recall, you recently told the whole world that what we’re having isn’t a Duma election, but a referendum on confidence in you. So how shall we interpret the results? Was it a victory? Let’s borrow a calculator and do the math. Total number of registered voters in Russia: 106.7 million. Number of people who voted for you: 43.5 million. That’s a lot of people. But it’s still less than half of the total number of voters. Next, we might ask how many of your 43 million supporters actually voted according to their conscience. This question should be asked – because the pressure was too strong, too harsh. The entire state hierarchy – from Kremlin officials and regional leaders down to janitors and school-teachers – was running around in a panic: ENSURE HIGH TURNOUT! ENSURE VOTES FOR UNITED RUSSIA! People were threatened with the prospect of losing their jobs, or other punishments, if they failed to vote correctly. For the first time, voting booths at many polling stations were open – with no provisions for a secret ballot. That’s something entirely new. Even during Soviet elections in the Stalin era, voting booths were screened off for privacy. Those millions who voted for you with their hearts must be feeling very frustrated, now that they’re being mixed up with those who were coerced into voting for you. But how can the two categories be separated? We’ll never know how many people voted for you willingly, motivated by trust and approval. For some reason, you wanted a nice-looking report card. And you got it. You won with just over 64% – which looks very convincing, if you’re counting percentage points rather than individuals. …By the way, why was voter turnout around 64%? Back in 1993, after the parliament building was shelled, people were very excited about voting. We had a real referendum – on the Constitution! But voter turnout was only 54.8%. …By the way, how come we have almost 107 million registered voters? In the elections of 1993, there were 106 million; in the elections of 1995, there were 105 million. And since then, as you have regretfully acknowledged on numerous occasions, Russia’s population has been shrinking by about one million a year. It turns out that mechanically copying the actions of others doesn’t actually work. We have elections, and ballot-papers, and ballot-boxes, and vote-counting. But when the West does this, the result is a parliament – while all we get is a thick foam floating on the surface, not sinking.